House Speaker John Boehner (R-Ohio) isn’t happy with President Barack Obama’s new agreement with China to lower greenhouse gas emissions. “It is the latest example of the president’s crusade against affordable, reliable energy that is already hurting jobs and squeezing middle-class families,” Boehner declared Wednesday morning. Boehner’s statement came just hours after the White House and the Chinese government officially struck a nonbinding deal for China to try to reach its peak in greenhouse gas emissions by 2030 and for the US to try to cut its emissions by more than 25% by 2025, according to Reuters. But for Boehner, newly emboldened after Republican victories in the November midterm elections, the agreement is nothing more than another sign that Obama is out of touch with the American people on energy policy. “This announcement is yet another sign that the president intends to double down on his job-crushing policies no matter how devastating the impact for America’s heartland and the country as a whole,” Boehner said. 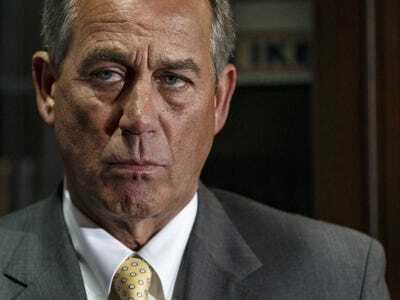 Boehner further vowed to try and block more of Obama’s energy agenda over the final two years of the president’s term. Other congressional Republican leaders have also blasted the deal. Sen. Mitch McConnell (R-Kentucky), who is set to become majority leader next year, panned the agreement as “unrealistic,” according to The Weekly Standard. “Our economy can’t take the president’s ideological war on coal that will increase the squeeze on middle-class families and struggling miners. This unrealistic plan, that the president would dump on his successor, would ensure higher utility rates and far fewer jobs,” said McConnell. Update (9:50 a.m.): With McConnell’s statement.